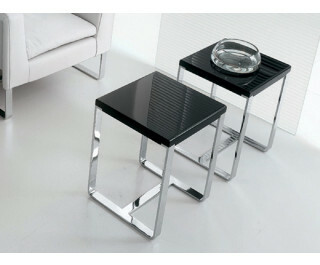 Refined lounge chair and coffee tables, flexible solutions, ideal for any room, perfect to add a touch of class. Club lounge chair in leather or fabric with base in chrome-plated steel. A relaxing space completed with the Club coffee tables. Studied using a proportion of layers between the base and frame, the Club lounge chair is ideal for both domestic and contract settings.